The first bumblebee of the year stumbled across my path today. It was close to a large clump of flowering Mahonia, but on the footpath, so I moved it to the flowers. It was a white-tailed queen bumblebee, Bombus lucorum. 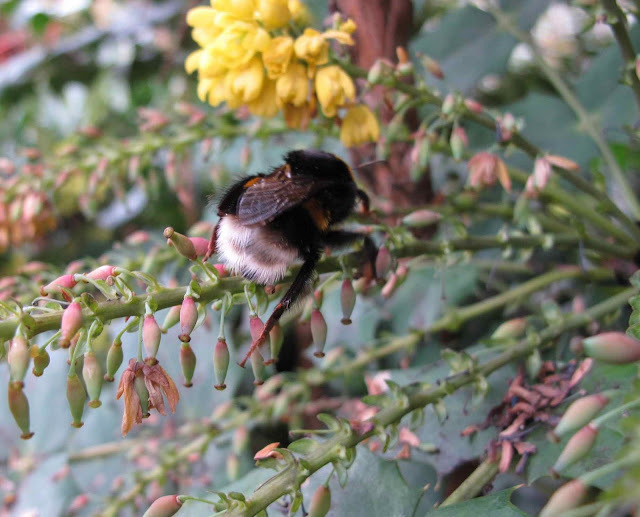 Recent bumblebee records from the BWARS (Bees Wasps and Ants Recording Society) site indicated that, instead of overwintering queens, there are now overwintering colonies -mainly of the Buff-tailed, Bombus terrestris but also Bombus pratorum, so that workers can be seen foraging in the winter. As far as I know this has not happened in Northern England yet, so the first bumblebees of the year are sleepy-looking queens in search of nectar and a nesting site. It was sunny and quite warm in the morning, so this bumblebee was awaken and came across this patch of flowers. I guess in the countryside must be quite tricky to find nectar this time of year, with gorse, snowdrops, lesser celandines and few other plants in bloom. Cities and their parks and gardens have much more in offer, rosemary, Mahonia, heathers, Hebe and many other mid-winter flowering plants, and I wonder if this - combined with milder winters - has something to do with this change in reproductive strategies. It would be interesting to test this comparing the strategies of countryside versus urban bumblebees. I wish I had B. lucorum in my garden - just the B. terrestris for me! I think Stuart at BWARS would still quite like the record if you send it to him (link on BWARS site). He tells me he is collecting early sightings until about the middle of March. I posted the photo to Wild About Britain and Stuart said he thought it was actually a large B. terrestris worker. Judging from the map of records in the BWARS site, it must be one of the northernmost overwintering colonies this year. It surprised me as it has been so cold! I was going to ammend the post when I came across your comment. I get at least 7 bumblebees in my garden over the year. The top hits for them are a hedge of lavender and two large Hebes that buzz all summer. I must write a blog on gardening for bumbebees! Hi I like your blog. Some good pictures and commentaries.